cinnamon - and lot's of it! 4 cashews, crushed - I just put mine in a baggy and banged it with an ice cream scoop...sometimes you have to be creative, right? Toss oats, sunflower seeds, and crushed cashews in a small frying pan and generously sprinkle with cinnamon - make sure to mix it all together. On low heat, roast the nutty oat mixture until it receives a nice smokey flavor, approximately 2-3 min, stirring occasionally; remove from heat when finished. In a blender (oh Magic Bullet, how I love you so! 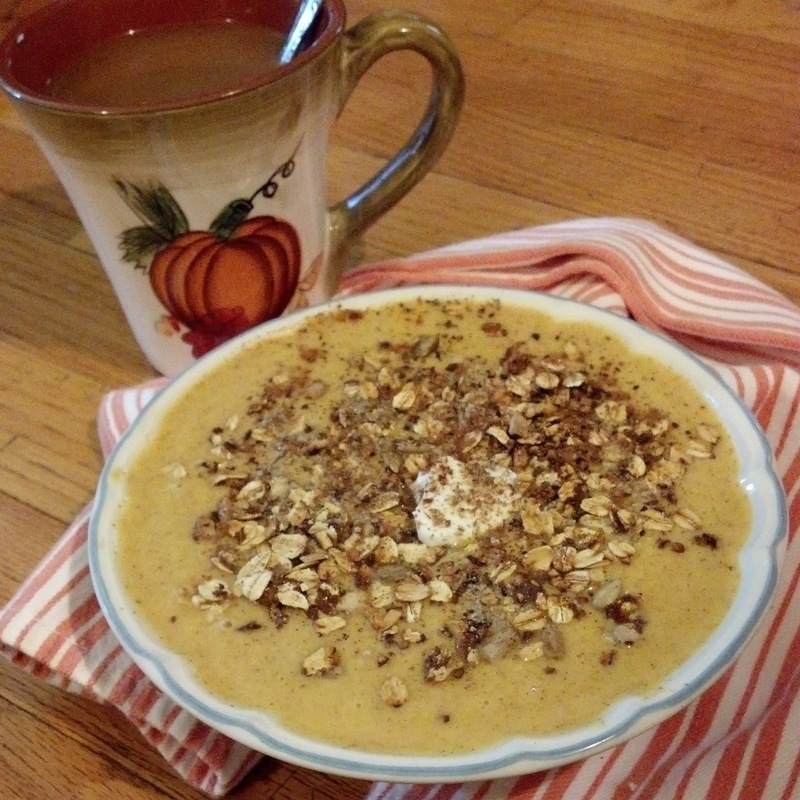 ), combine pumpkin puree, almond milk, yogurt, and cantaloupe and blend blend blend until it all mixes together. After it is all blended, add a bunch of ice cubes - you can do this step along with the other ingredients if you have a nice, big, super-powered blender...as much as I love my Magic Bullet, there are some limitations but it's okay with me! I added about 6-8 ice cubes; I wasn't really keeping track, but I just looked for it to be more icy compared to watery. One last step - add in a ton of cinnamon...and I mean a ton (well, as much as you can handle...no cinnamon-challenge here, thank you very much!) - and the ground flax, and blend it one last time. 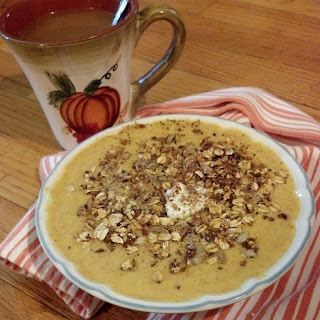 Pour the creamy canta-pumpkin soup into a bowl, sprinkle with the nutty cinnamon oats, and partake in the lovely hot day soup!